Archives for 2016 | What Is New With NeoFinder? NeoFinder 7.0 is available today! Download the demo or buy a license or an update now. NeoFinder requires Mac OS X 10.7 or newer. If you use an older Mac OS X, we still have older NeoFinder and CDFinder versions for you. NeoFinder has been certified to run in macOS Sierra! NeoFinder now runs in seven major Mac OS X releases! Get NeoFinder for iOS now in the Apple App Store! The version has only two little fixes, but one of them is very important when you still use the old Mac OS X 10.6.8, so we have decided to make it available today! We are happy to announce the availability of NeoFinder 6.9.1, with a lot of fixes, small improvements, and tweaks. You can now select multiple movies for the Video Contact Sheet, and NeoFinder will generate a cool contact sheet for each of them! NeoFinder iOS 1.6 is finally here! This time, it took a long odyssey through Apples intransparent and unpredictable approval process to give you the new and enhanced NeoFinder iOS 1.6. But the epic fight was worth it, there are some really exciting new things in this new version! 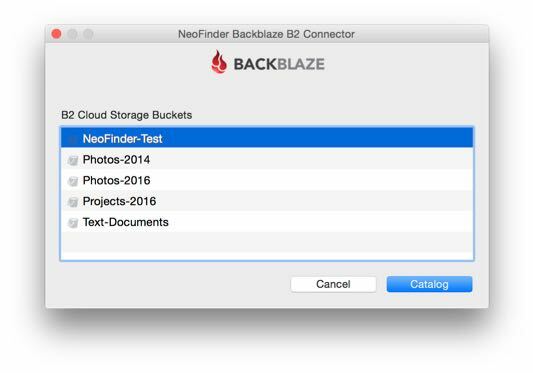 Announcing Backblaze B2 cloud cataloging support in NeoFinder for Mac! We have been working together with the nice people from Backblaze, to add this unique ability to catalog Backblaze B2 buckets in NeoFinder without the need of any other software. Directly log into your B2 with NeoFinder, and catalog any of your buckets there. This is part of the upcoming NeoFinder 7.0, but we can provide you a developer Preview with this feature already enabled. If you are interested in this, please contact us, as we are still looking for beta testers for this! More about this incredible new feature in the NeoFinder Users Guide. NeoFinder iOS 1.5 is out now! Apple has super quickly approved the new version 1.3 of NeoFinder for iOS, so you can update now, or get a license for your iPhone or iPad. - The Dropbox connection has a new Load All button that will download or update all catalogs in the currently viewed Dropbox folder! NeoFinder for iOS is available today in the Apple App Store! The long awaited Importer for Extensis Portfolio database Exports files is finally here! Since this version also fixes some very important security problems, it is strongly advised to update as quickly as possible! Cataloging of Adobe XMP data now also reads the "AuthorsPosition"
Fixes a problem with "Find kind is NOT..."